Would Taco Bell&apos;s new Steak Rattlesnake Fries deliver some spicy bite? Published March 15, 2019 at 6:46 p.m. Wait, You Can Call Taco Bell?! We've been burned before by one of Taco Bell's supposedly spicy special offerings – and not in a good way. Just last November, Nick and I chowed down on the fast food chain's Reaper Ranch Quesarito, but despite its hellish-sounding name, the bold burrito wasn't that bold at all. If you've had a Taco Bell dish before, you'd had a Reaper Ranch Quesarito – for better and for worse. I'm never going to complain too much about a lunch of Taco Bell – they effectively tap into the most basic part of one's appetite that craves melty, beefy, cheesy and vaguely flavorful food – but I am going to complain if I order a spicy dish that brings about as much heat as a Milwaukee day in February. 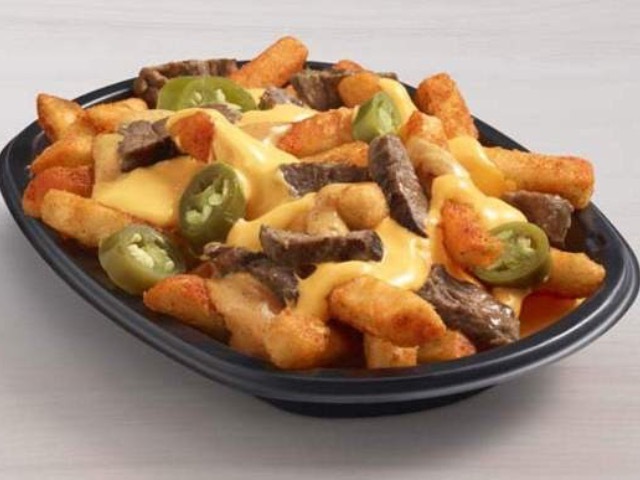 The big wigs at Taco Bell HQ, however, must've heard our complaints, as just a few months later, the fast food company released its Steak Rattlesnake Fries, supposedly the chain's "spiciest offering ever." The dish is basically Taco Bell's version of loaded fries, featuring the brand's seasoned (and, in my experience, disappointing) nacho fries covered in steak chunks, slices of jalapeños, classic nacho cheese sauce and a bonus creamy jalapeño sauce. A double dose of jalapeño power should create a doubly spicy dish, right? That's just math. Or maybe not. Would the Steak Rattlesnake Fries strike our taste buds like a viper? Or would Taco Bell once again ring false? Let's dish in! Nick: Taco Bell's Steak Rattlesnake Fries come covered in nacho cheese, steak bites, an ostensibly spicy cream sauce, pickled jalapeños ... and not much heat. Add the sog of a cross-town drive, and you can imagine our disappointment. The only real surprise is that they're somehow even less spicy than we figured. The only heat came in the form of your standard ballpark pickled jalapeños; the creamy jalapeño sauce was mostly just creamy. Drop everything and get them right now if you love stadium nachos but wish they didn't crunch so much. Stay away otherwise. Matt: Fool me once, shame on you. Fool me twice ... shame on you, again. Once again, Taco Bell promised spice and heat, and instead delivered your typical Taco Bell flavors dumped onto some fries. In fact, if I didn't know any better, I'd say the Steak Rattlesnake Fries were actually LESS spicy than the chain's last attempt at fiery food. Come on, guys; the bar is so low for spicy fast food that it's practically on the ground – and you're still tripping over it! The creamy jalapeño sauce is tasty but it also nullifies any spiciness it brings to the table with its cream base – and even if that wasn't the case, you've got potato in the nacho fries to help cushion what little blow it offers. The nacho cheese sauce is, well, nacho cheese sauce. If there's any heat to be found here, it's in the jalapeño slices – but even with that, they're more sweet than spicy, the processed peppers you get at a baseball game or movie theater as opposed to the punchy real thing. In other words, it's just another Taco Bell dish – and while there's certainly worse things in the world to eat for a snack, these Steak Rattlesnake Fries don't have anything close to the bite of a rattlesnake. They don't even bring the threat of a garter snake. These things are more like those cloth snakes that pop out of a fake can of mixed nuts: a disappointing lie that offers the wrong kind of surprise.